Maybe some of you remember me forecasting (back in March) hand sewing patterncards for Spring/Summer? We took photos, wrote out instructions, Tim laid out the patterns, we rustled up an amazing group of testers and got 99% of the way finished and then new house and baby took over. We hadn’t had a chance to look at them since. Until today… thanks to Grandma’s help with the kiddos we are now 99.9% finished. Butterflies, turtles, birdies and snails are on the horizon! If you’d like to be notified when they’re in the shop you can sign up on the mailing list here. soo cute… i can’t wait! delurking to say I must have those. Those are adorable. yay!!! not quite as cute as phoebe but faster to make. I’m looking forward to ordering my copy. OK- I am feeling a burning need to have those too! Can’t wait! Can you give a little hint as to when they might become available? Can I plan on these as Christmas gifts? i didn’t forget and have been checking back and hoping, but know you have been extremely busy! thank you! I have been dying for them for months. I am so excited!!!!!!!!! Terribly selfish of me. But you need to add a bundle in your shop, so that people like me, who want them ALL can just click and buy! Tee hee. Love these!! Can’t wait to get my hands on the pattern!! This is so exciting. I figured the new baby probably didn’t give you too much time. But I have to admit I’m looking forward to this new bunch to start sewing. Damn, those are cute. I can’t wait………. Oh my!! I’ve been waiting for these! Well done! 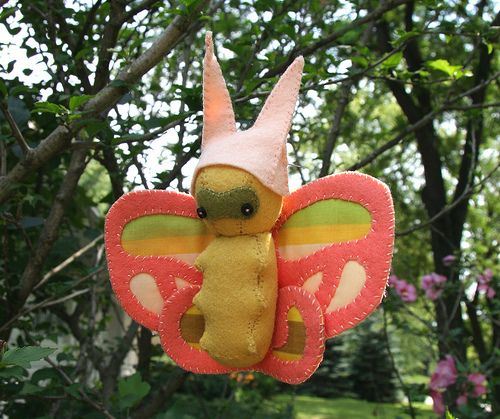 I remember the butterflies, so adorable with their little hats, and the other critters too! Ack!!! I love it! It’s your best yet – must have been all those happy pregnancy hormones helping out. hand sewing for fun? i didn’t know there was such a thing. ah me, i guess i’ll give it a whirl! and btw, your daughter is lovely. How cute is that! Can’t wait! Oh yay! I am so excited about this! Can’t wait!